Antique Map South-East Asia by Moll titled ‘A Map of the East-Indies and the adjacent Countries; with the Settlements, Factories and Territories, explaning what belongs to England, Spain, France, Holland, Denmark, Portugal &c. with many Remarks not extant in any other Map By H. Moll Geog. To Ye Directors of Ye Hon. ble United EAST – INDIA COMPANY. This Map is most Humble Dedicated by your most Obedient Servant Hermann Moll Geographer’. Herman Moll’s large format map of India and Southeast Asia, including China and the Philippines, one of the most decorative and sought after maps of the region published in the 18th Century and the first large scale map of the region published in England. 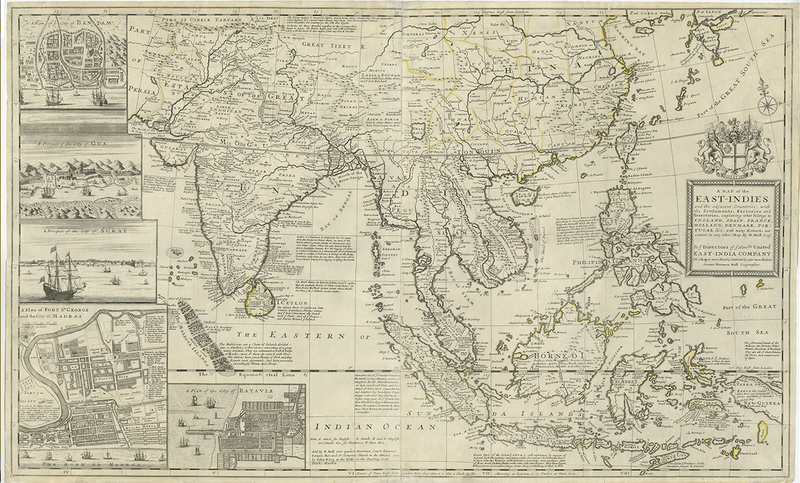 The present map depicts the East Indies from the Persian border to New Guinea and the southern part of Japan, including India, Ceylon, Southeast Asia, most of China, present Indonesia, the Philippines, etc. It is augmented by insets featuring a plan of Bantam (a major port in Dutch-controlled Java); a view of Goa (the principal Portuguese base in India); a view of Surat (an English trading post in India); a plan of Madras, India (a major English base); as well as a plan of Batavia (the capital of the Dutch East Indies, today known as Jakarta). Richly annotated, the map illustrates the extent of European influence and trade, at the height of colonial influence throughout this critical region. 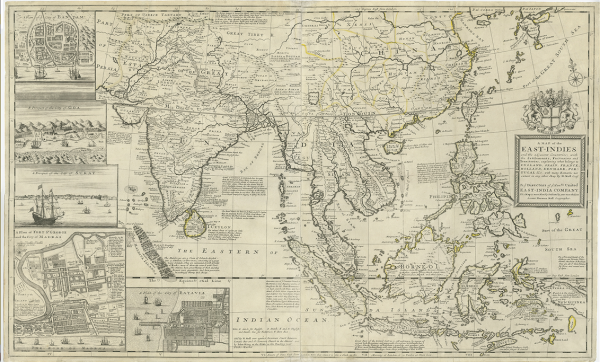 Importantly, the map was the most popular and authoritative general cartographic representation of South and East Asia published during this period when the activities of the East India Company (EEC) had risen to the forefront of the economic life of the British Empire. The EEC, whose arms appear in the far right of the map, was a private syndicate that was granted a charter by Queen Elizabeth I in 1600, that henceforth allowed it a monopoly on all English trade with the East Indies. By 1720, the EEC’s activities accounted for 15% of Britain’s total imports. Its activities were focused on the Indian Subcontinent, with its immense wealth in precious gems, gold, textiles, tea and saltpeter (the key element for making gunpowder). The EEC gained its initial foothold in India in 1612, upon being given permission by the Mughal Emperor to open a trading post in Surat. Indeed, over a century later, Moll noted on the map, “The Town of Surat is of ye Greatest Trade and Note in India”. In 1634, the Company was given special trading privileges in the wealthy region of Bengal, the center of the subcontinent’s lucrative textile trade. The EEC expanded its operation to the Coromandel Coast, founding Fort George (Madras) in 1639. By 1647, the Company had 23 factories spread throughout coastal India. The EEC’s ascendency in the region reached a highpoint in 1668, when the Islands of Bombay (today’s Mumbai) were given to England by Portugal as part of Charles II’s wedding dowry. However, in 1689, the EEC’s great era of expansion was endangered when English pirates attacked Mughal interests, to the great consternation of Emperor Aurangzeb. Mughal forces seized Bombay and threatened to drive the English out of India. Only skilled diplomacy averted what would have been a disaster for the English economy. The ECC placated Aurangzeb, and in 1690 were permitted to found Fort William (Calcutta) in Bengal, which later became the capital of British India. Not long after this map was published, the Company’s horizons expanded further. In 1717, the Mughals granted the British an exemption from all customs duties in Bengal. Moreover, in 1711, the EEC opened up a massive new market when China’s Kangxi Emperor granted the Company rights to trade for tea and silver at Canton (Guangzhou). While the EEC was preeminent in mainland India, the map also shows the territories controlled its competitors, notably; the Dutch who dominated Indonesia, the Malay Peninsula, Ceylon (Sri Lanka), as well as maintaining a post in Japan at Nagasaki; the Portuguese, who held several enclaves in India (notably Goa), as well as Macao in China; and the Spaniards who governed the Philippines. As noted on the map, various European powers maintained factories along the Indian coastlines, although these enterprises did not seriously rival the ECC interests on the subcontinent. Herman Moll, who was famously known as one of the era’s most commercially savvy mapmakers, devised the map as a celebration of the EEC’s success, in an effort not only to appeal to public interest, but to gain the patronage of the Company’s wealthy investors. Fittingly, the map is ‘humbly dedicated’ to the EEC’s directors. The present edition of this important and highly attractive map bears the imprint of Moll and John King as map sellers.